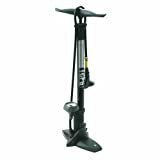 The Serfas TCPG Floor Pump for Bikes is a biker’s best travel companion offering a very durable and flexible floor pump that’s extremely easy to use. It is not bulky yet tough and can even fit in a backpack so you can carry it around in case of emergencies. It comes with a pump head that fits securely and adapts easily to most valve head of bikes. Employs a tough valve head connector for the pump that fits easity on schrader and presta valve head. Fabricated from a barrel that is all round metal and utilises a base made from nylon. Provides a pump capacity of one hundred and sixty pounds per square inch. Comes with all the necessary attachments needed for the balls and accessories. 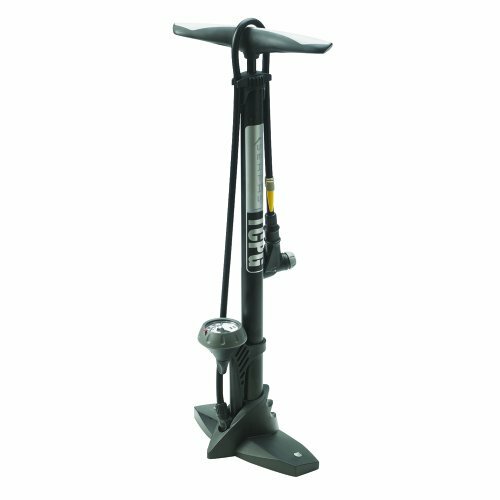 The Serfas TCPG Floor Pump for Bikes is a very easy to use, small, lightweight yet tough pump that is operated by mounting it on the floor. It can be used on different bikes and it delivers adequate pressure for quick and efficient inflation of tires. It attaches to the valve head very tight without any allowance for wobbling and the pressure gauge outputs accurate pressure information even in higher levels. It is designed with very tough steel tubing that delivers well and last long. It is advisable to maintain a steady grip and control on the valve tubing when inflating above eighty pounds per square inch as unstable movements will cause the seal to loosen a bit thereby causing loss of air pressure and increasing inflation time. As an extra, the pump can aslo be used to inflate balls and comes with the necessary fitments to achieve this. All in all, the Serfas have produced yet again another amazing product and it comes recommended for any biker who is into long distance riding as it fits easily in any backpack, making it handy for emergencies.